When I was kid, the best part of my day was when I was given a handful of cookies and a large glass of milk. There was something about that moment that made the lost baseball game or the moment that day when I scraped my knee, not matter anymore. I don´t know about you, but that is still true for me today. 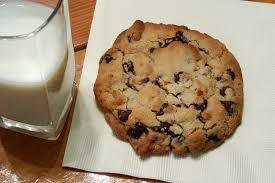 If you have a cookie and milk craving like me, check out this New York City hot spot: Milk and Cookies Bakery. 19 Commerce St is banging out some amazing delights, so don’t miss your chance to get your hands on your daily helping of cookies and milk after a long day’s work. They are open from 11AM-10PM Sunday through Thursday and are open till 11PM on Friday and Saturday. pieces, toffee pieces, and the most important ingredient; love. They are also known for their decadent cookie sandwiches, bars, brownies, and of course milk!